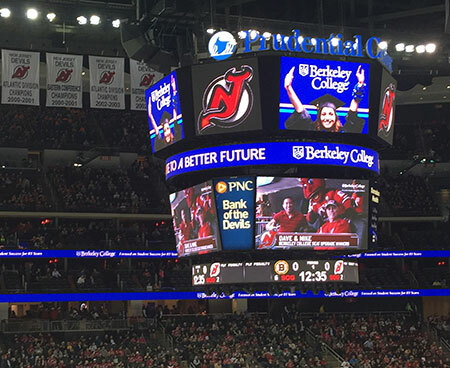 Berkeley College will continue its commitment to helping the local community when the New Jersey Devils host the Dallas Stars during “College Night” at Prudential Center on March 26, 2017. Throughout the game, students and staff from Berkeley College will raise awareness for the College’s upcoming charity initiatives. Berkeley College also will receive assistance from volunteers of the Garden Academy, a best practices center for the treatment of autism based in New Jersey. Together they will help register Devils fans for the charity cycling event, Go the Distance for Autism Ride, occurring on June 4, 2017, in Paramus, NJ. In addition to Go the Distance for Autism Ride, the Berkeley College community will help register Devils fans and raise funds for events such as the Susan Zabransky Hughes Memorial 5K Run, being held on April 29, 2017, in Saddle River, NJ; Walk MS, on April 30, 2017, in Leonia, NJ; and Walk to Cure Arthritis New Jersey, on May 21, 2017, at Berkeley College’s campus in Woodland Park, NJ. Last year, Berkeley College partnered with the New Jersey Devils and Prudential Center to raise funds for 100 blankets donated to the Children’s Hospital of New Jersey at Newark Beth Israel Medical Center in Newark, NJ.